THE DIGITAL COPY OF THIS ISSUE IS TEMPORARILY UNAVAILBLE WHIST WE MOVE IT OVER TO A NEW SERVER LIBRARY. APOLOGIES FOR ANY INCONVENIENCE. 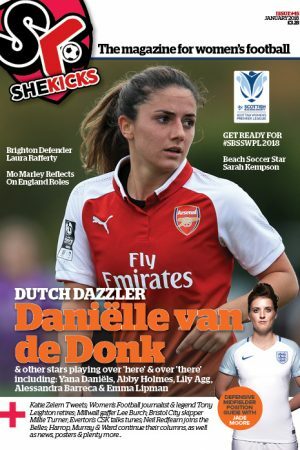 Issue 38 of She Kicks magazine is available in digital format. You can view this digital edition FREE. View the digital magazine in your web browser anytime you are online or download it to your tablet/phone device. 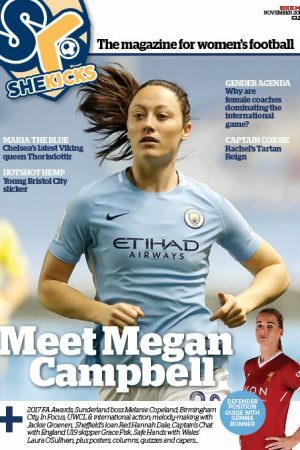 56 pages of pure women’s football. 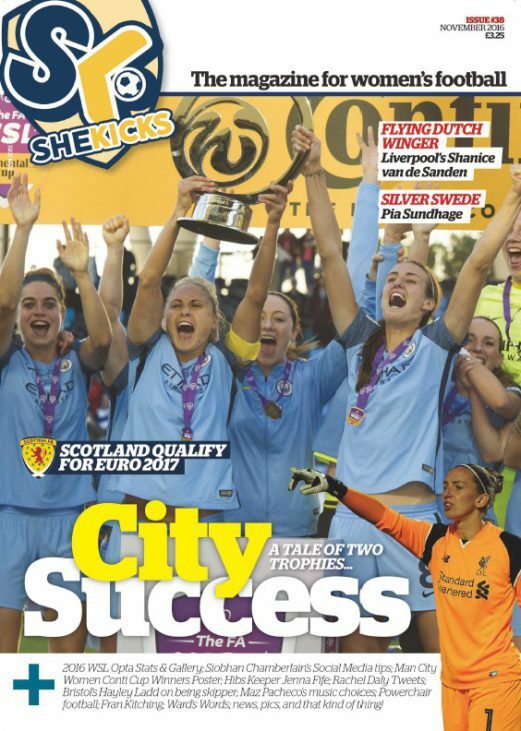 England and of course Scotland have qualified for EURO 2017, while Man City have won the WSL & Conti Cup. We salute each achievement. 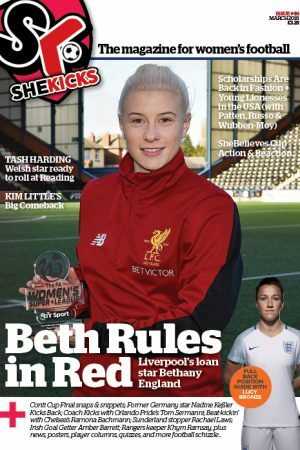 Liverpool’s Shanice van de Sanden is one of several Dutch internationals in the WSL, so we find out more, plus England/Houston Dash’s Rachel Daly tweets, Reading/Wales’ Helen Ward continues her column, Pia Sundhage reveals her coaching thoughts, Hibs keeper Jenna Fife chats about learning, Siobhan Chamberlain talks social media, Crewe & Spurs feature, Hayley Ladd discusses captaincy, Emma Coolen gets all shirty and soooooo many more bits and bobs. TO ACCESS YOUR COPY SELECT BUY NOW AND PROCEED TO CHECKOUT. THE DIGITAL DOWNLOAD INSTRUCTIONS WILL BE STORED ON YOUR ACCOUNT. THESE CAN THEN BE ACCESSED BY VIEWING THE ORDERS STORED ON YOUR ACCOUNT OR CLICKING ON THE LINK IN YOUR ORDER CONFIRMATION. We hope you enjoy reading this free copy. 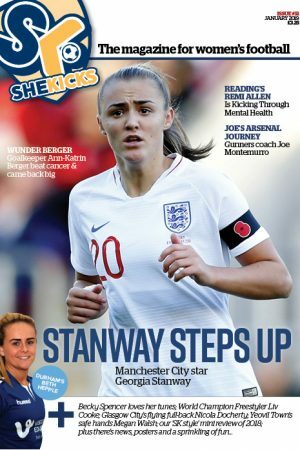 You can subscribe and receive the next 7 issues of She Kicks Magazine (digital version) for only £6. Go to ‘SK Digital’ section of the shop to subscribe. Email: shop@shekicks.net if you have ANY queries.